Bring a large pot of water to a boil. Add salt and pasta and cook according to package directions (usually 7-9 minutes for el dente paste - tender but firm). Stir well. Meanwhile, heat 1 tablespoon olive oil in a large frying pan. Add smashed garlic and chopped bacon. Leave to brown, stirring every so often. Crack egg into a mixing bowl. Add sour cream, Parmesan cheese, sea salt and pepper, mint and lemon zest. Whisk everything together and set aside. Add white wine to pan with bacon. Allow to bubble away, stirring. Leave to reduce slightly. 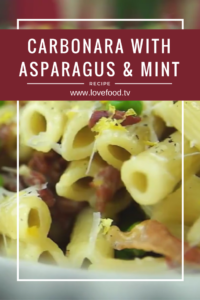 When pasta has just 1 minute left of cooking time, add asparagus and peas. Take bacon off the heat and discard whole cloves garlic. Drain pasta and vegetables and tip into the pan with the bacon. Quickly add egg and cheese mixture and toss everything together. Transfer to a serving platter and top with more grated Parmesan, lemon zest and black pepper.